Sir Walter Raleigh was an English explorer. 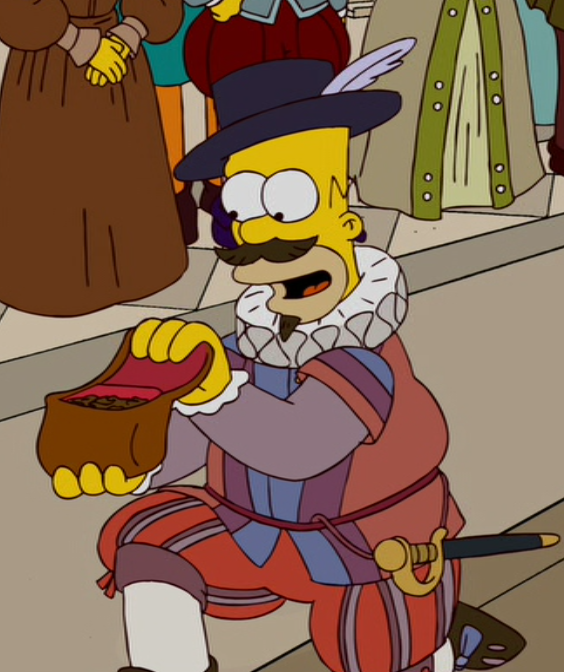 Homer was held in a cell at the Tower of London after he crashed into the Queen's carriage. Lisa found a way out from the cell and helped Homer to escape through a secret tunnel that was used by Sir Walter Raleigh, but she found out too late that the secret tunnel ended in the queen's bedroom and Homer was captured again. After Raleigh returned from the New World he had a gift for Queen Elizabeth I - tobacco - which she started to enjoy. During his visit to the castle he met Queen Elizabeth's Lady in Waiting and started falling in love with her. When Elizabeth I discovered this she wasn't happy. Meanwhile, Spain started to attack England, so Raleigh was sent to a battle ship which he accidentally set fire to. He then jumped from the ship, which crashed into the Spanish Armada, which resulted in the end of the war. For destroying the Spanish Armada the Queen gave him the title "Sir" and granted Elizabeth Raleigh and Walter Raleigh her blessing, allowing them to get married. ↑ ""Four Great Women and a Manicure"
Modified on February 4, 2013, at 13:09.